These words are so beautiful and contain the essence of Sikh ideology. To a non-Sikh the Guru Granth Sahib Ji may seem just a book, a piece of well constructed literature from the 15th century; but to a Sikh the Guru Granth Sahib Ji is much more than that. To a Sikh Guru Granth Sahib is their living, breathing, talking spiritual guide or Guru. I don't think that as Sikhs we as a whole have grasped onto this concept fully. Sure Guru Granth Sahib Ji is in every Gurdwara, we all bow down before the Guru, ask for things we want both material and spiritual from the Guru and outwardly acknowledge that Guru Granth Sahib is our Guru. 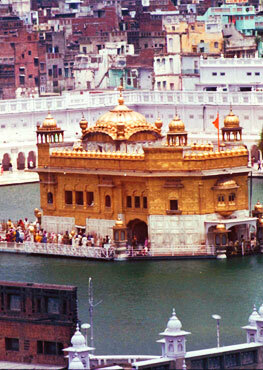 But have we really understood what the Guru-ship of Guru Granth Sahib means? When we have spiritual questions do we look to Guru Granth Sahib Ji for advice? Do we acknowledge Guru Granth Sahib Ji's guru-ship purely ritualistically and not practically? Many will ask how talking to Guru Granth Sahib is possible, and if so what the method is of communicating with Guru Ji. Since Guru Gobind Singh Ji bestowed Guru-ship upon Guru Granth Sahib, Sikhs have been asking Guru Granth Sahibs Ji's advice and for Guru Sahibs spiritual guidance through the tradition of taking a Hukumnama. The word Hukumnama literally means, 'royal decree'. The method of taking is a Hukumnama is by performing an Ardas in front of Guru Granth Sahib Ji, in this ardas you can ask a question or simply ask for Guru Ji to bless you with some words of spiritual wisdom. At the end of the Ardas taking Guru Ji in both hands you open the pages of Guru Granth Sahib ji at random and the first Shabad on the left hand page of Guru Ji is the 'Hukumnama' filled with the spiritual wisdom or answer that you require. Even today a Hukumnama is taken in each Gurdwara daily when Guru Granth Sahib Ji is opened in the early hours of the morning; this seva of opening Guru Granth Sahib Ji is called Parkash Seva. You can read the Hukumnama which is issued by Guru Granth Sahib Ji from the Harimandar Sahib in Amritsar everyday. This Hukumnama is considered to be the Guru's royal decree for the whole Sikh nation for that particular day. Don't think that Guru Granth Sahib Ji is a piece of ancient literature which has no value in modern day life. Each page of Guru Granth Sahib Ji is filled with the highest spiritual wisdom known to man, and a Hukumnama taken with love and faith can change lives. I personally saw someone who was addicted to drugs take a Hukumnama from Guru Granth Sahib Ji asking if Guru could forgive his past mistakes and Guru Ji answered in the Hukumnama, â€œPlease forgive my past actions, God, and place me on Your path for the future.â€ When I heard these lines my eyes filled with tears and my faith in Guru Granth Sahib Ji grew many times strongerâ€¦ Your Guru can talk to you, Guru Ji can give you guidance, Guru Ji can communicate with you - but are you willing to listen? If you have a spiritual question in your heart, go ahead and take a Hukamnama yourself. Prepare yourself to ask a question, to Guru Nanak Dev Ji or Guru Gobind Singh Ji, because all ten Gurus reside spiritually within Guru Granth Sahib Ji. If you are at home and haven't got access to Guru Granth Sahib Ji don't think that you have no way of asking your Guru that all important spiritual question, you can go online and take a cyber Hukumnama on SikhNet. The answer to your question will be coming directly from Guru Nanak Dev Ji. At the end of the day who better to answer your spiritual questions than Guru Ji?